Do you always find yourself scrubbing your driveways, bike, garden tools and even your car? Well, you can avoid all these scrubbings by getting an electric water washer which gets the job done with ease. Electric pressure washers blast water at high speeds cleaning pretty much everything in the shortest time possible. They also help you conserve water as they use very little. You will never lack a cleaning activity that does not require a water washer at home. 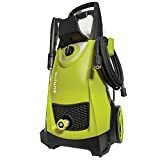 This article will help you review some of the best electric pressure washers on the market so that you don’t have any a selection headache. Read through and choose an electric water washer that best suits your needs and desires. 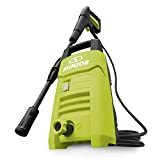 This is a versatile pressure washer with five easy to connect spray tips to help you select a wide range of cleaning options. You can choose from light cleaning, medium and heavy-duty cleaning depending on the task at hand. It is a powerful washer with a 14.5amp/1800 watt motor that helps generate a pressure of up to 2030 PSI. It also uses the total drop system that automatically shuts the washer whenever the trigger is not engaged. A further dual removable tank helps carry and store different detergents. The SPX3001 Sun Joe is another quality product to help you avoid scrubbing. It has a powerful motor 14.5amp/1800 watt capable of generating up to 2030PIS/1.76. This gives you the maximum power to get rid of any dirt. The washer has a 20feet high-pressure hose that is kept organized through an onboard reel. You can choose from the five available connect tips depending on what you’re cleaning. Automatic shut off when the trigger is not engaged is made possible through a total stop system. This helps save energy and further prolongs the lifespan of the washer. Greenworks is an Eco-Friendly Pressure washer that works efficiently making less noise and an ideal option for residential complexes. You will never have noise issues with your neighbors. It is a powerful washer with 1700 PSI pressure capable of blasting through dirt and grime to leave surfaces looking clean. For improved stability during use, the washer can be used vertically or horizontally. It also comes with 25 degrees and 40 degrees quick connect tips to give you options when cleaning. The hose is long 25ft and comes with a reel for easy reach and storage. A long power cord 35ft further ensures you can wash outside without any issue. This is a middle-level electric pressure washer ideal for medium and light cleaning tasks. It has a powerful 10amp motor that gives users a 1350 PSI pressure and a maximum flow of water. The adjustable spray wand allows users to twist the nozzle to suit various cleaning applications easily. The use of the total stop system further ensures automatic shut off where the trigger is not engaged. This is a good featured that helps save energy and prolong the lifespan of the washer. It is CSA approved and comes with a 2-year warranty. 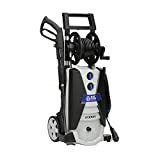 This Sun Joe pressure washer is a powerful pick best suited for the heavy duty jobs. It is an ideal choice for washing heavy machinery, pathways, and heavy vehicles. It has a 14.5amp motor and gives a maximum pressure of 2030 PSI. It is fitted with easy glide wheels to allow you move it with ease. An onboard hose reel enables quick access and storage. You can choose from the two available pressure options of 1450 PSI and 2030 PSI depending on the task. A further 5-quick connect things gives you wide cleaning applications. 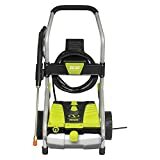 The Simpson is a powerful 3100 PSI pressure washer with capabilities of removing just any grime and dirt from surfaces. It is highly rated water washer that is easy to use and a good investment of your money. It has a strong, kink and abrasion resistant hose that is lightweight and flexible to use. The high-pressure hose pipe is 25 foot long and can withstand heavy-duty use. It comes with M22 connectors for a secure and safe fit. You also get five different nozzle tips to suit various cleaning applications. This is a professional washer with a high-quality spray gun fitted with a safety lockout. You can be sure of cleaning floors and services in a matter of seconds. Annovi Reverberi water washer is a compact and lightweight choice for efficient outdoor cleaning. It is an ideal washer for cleaning patios, decks, driveways, siding, cars, ATVs, trucks, RVs and even the outdoor furniture. The washer comes ready for use with all necessary attachments included. 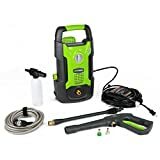 There are two different washer wands, 14oz detergent bottle, 20-foot high-pressure hose pipe and a professional style gun. It has a quieter engine and helps conserve water by spending 80% less compared to other models on the market. It is also easy to assemble and has a great customer service. 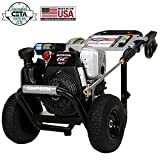 This is another incredible pressure washer with an amazing cleaning power of 2, 200 PSI and 1.5 GPM for maximum scrubbing and cleaning. The high power is made possible through the 1800watt/14.5amp motor. You also get five low and high-pressure nozzles to suit various cleaning applications. The system of the washer is pretty easy to use with just a 30-second setup. The copper connections easily join with the hose and nozzle for an effortless hookup. Overall, this is an ideal water washer for all types of vehicles, pathways, and patios. 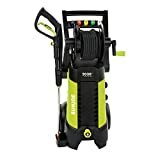 The AR390SS is the best electric pressure washer this year on the market and a top product to consider buying. 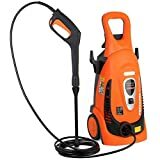 It is a highly rated pressure washer and an ideal choice for most outdoor cleaning. With a universal 120V 60Hz motor, this pressure washer was the top rated as per the consumer reports in 2016. 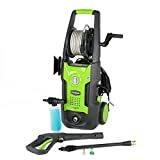 It comes with a professional pressure gun, 30-foot hose pipe, 4-quick connect pressure washer nozzles and 48oz detergent tank. It is environmentally friendly and consumes less water by 80%. The washer also works quietly and efficiently making it ideal for homes with close neighborhoods. Make cleaning a lot easier at home or work by getting one of these amazing pressure water washers. They are well-priced, highly rated and best placed to offer you good value for your money.